At Power Washing Springfield MO: Cleaned by Pete, we are focused on providing the best cosmetic cleaning services with the highest levels of customer satisfaction – we will do everything we can to meet your expectations. With a variety of tool and equipment to choose from, and several methods and techniques of washing, we’re sure you’ll be happy working with us. Look around our website and our sister-site Cleaned by Pete and if you have any comments or questions, please feel free to contact us. Check out our blogs for new updates and information about our cleaning industry at: House Washing Springfield MO or What a Power Washer Does which are set up for our customers and prospective customers. You can learn what you can expect and what to look for in a professional cosmetic cleaner. There’s much more to come! We are entering our 5th year as a locally owned small business with more than 8 years of experience in this field; we offer our customer the best value and cleaning available in this area, call us for a free prompt estimate at 417-459-7869. 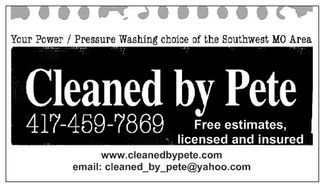 Cleaned by Pete wants to be your professional cosmetic cleaner in the South-west and greater Springfield Mo area.